A storm system is beginning to get its act together in Northern Texas. An area of sleet and freezing rain has now developed ahead of the low pressure in an area of significant lift in the atmosphere, along an area of baroclinicity. Much of this precipitation will kick over to all snow as cold air wins out in Illinois and points east. As the system cross into the Southern Ohio River Valley, it will begin to deepen and draw in significant Gulf of Mexico moisture and deposit it into the cold air mass to the north. Ground temperatures will are cold enough for accumulation to begin at the onset of the snow. A wide area of 3-6" will be likely north of the Ohio River, with the potential for up to 7" or 8" in an area that has the potential to stay all snow throughout the event. 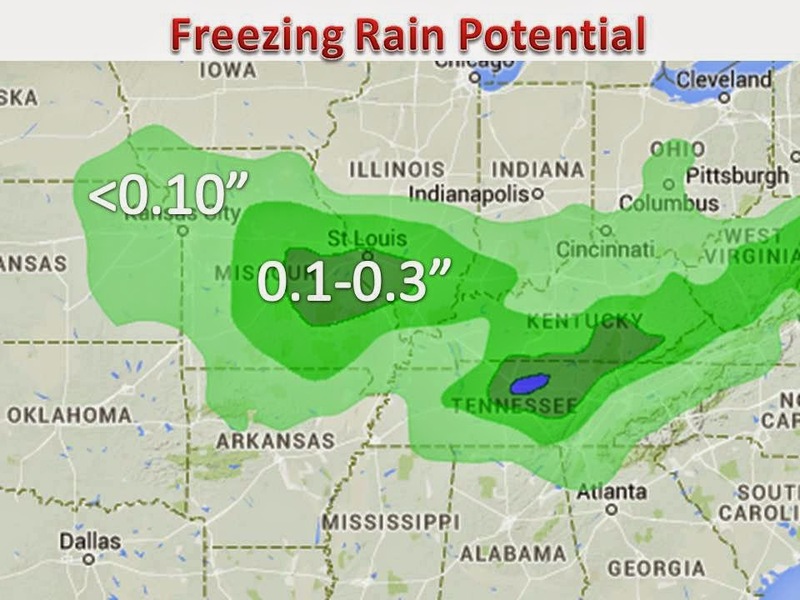 On the warm side of the system, freezing rain will be a concern. Winter storm warnings and ice storm warnings are in effect for tonight through Saturday. On the right is the freezing rain potential, courtesy of the WPC. With warm air aloft and a substantial cold air layer near the surface, ice accumulation is yet again going to stack up, on the order of a quarter inch or more. Power outages and impassable roads can be expected in the hardest hit locations. 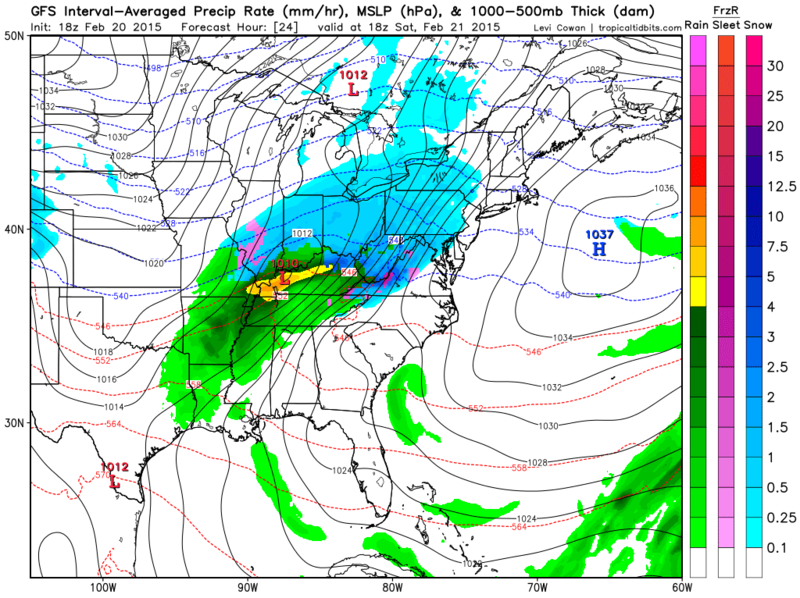 We have attached a snapshot of the 18z GFS, at the height of the storm. 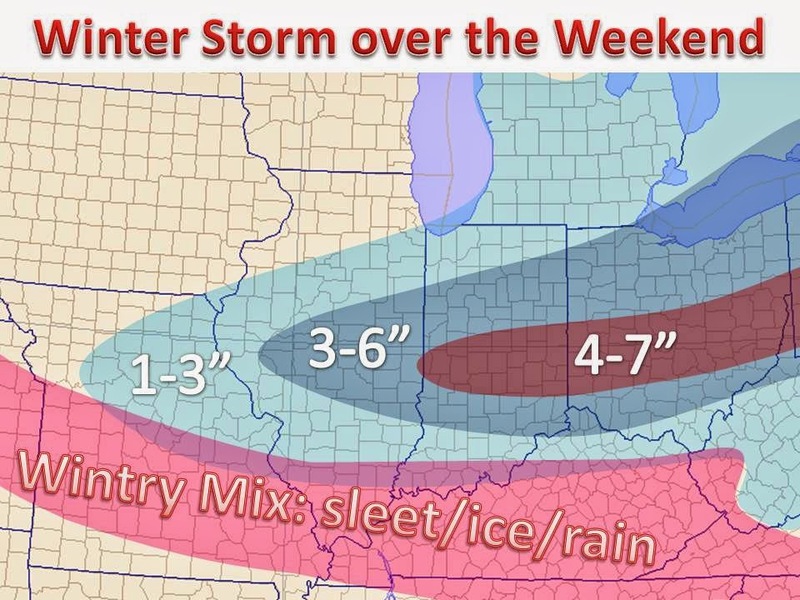 One thing to notice is that the rain/snow line, as per usual, will feature a sharp cut off. Any minor tweaks to the track, or strength of the cold air could majorly impact snow totals in some areas. Along with the expansive cold across the eastern US, winter is definitely not over yet. The pattern looks to stay cold for the next 10 days, when we may switch over to a more zonal and warm pattern, fingers crossed.